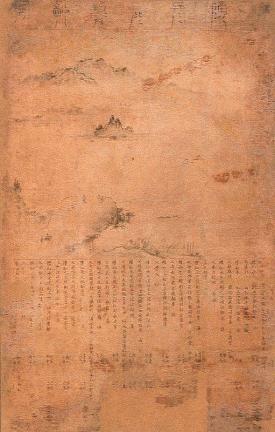 정사신 참석 계회도는 선조 때의 문신인 정사신(1558∼1619)이 1583년에서 1587년 사이에 관원으로서 참여했던 계 모임을 그린 6폭의 그림이다. 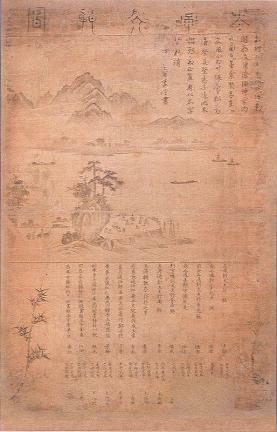 ‘괴원장방계회도’(槐院長房契會圖,1583년경), ‘봉산계회도’(蓬山契會圖,1583년), ‘태상계회도(太常契會圖,1585년), ‘예조낭관계회도’(禮曹郎官契會圖,1586년), ‘형조낭관계회도’(刑曹郎官契會圖,1586년), ‘미원계회도’(薇垣契會圖,1587년)로 구성되어 있는데, 봉산계회도, 태상계회도, 형조낭관계회도는 16세기 전반 안견파의 편파구도 산수의 전통을 토대로 경물들의 분리가 확대된 변화를 보여준다. 괴원장방계회도, 예조낭관계회도는 서호계 야외계회도의 특징을 반영하고 있다. 미원계회도는 1570년대 경 대두된 관아묘사 계회도의 새로운 유형으로 제작되었다. 이 계회도는 제작연대와 참여자들이 확실하게 밝혀져 있고 1580년대의 화풍을 반영하고 있어서 학술적, 회화사적 가치가 높으며, 동일한 인물이 참여했던 여러 폭의 계회도 일괄이어서 자료적 의미가 매우 크다. 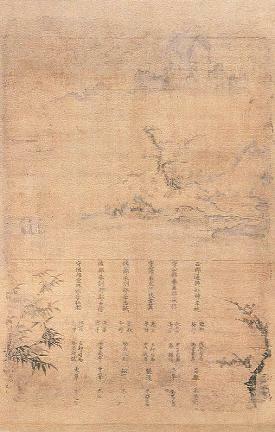 This Gyehoedo (Gathering of Officials) on a six-panel folding screen depicts the social gatherings held between 1583-1587, and in which Jeong Sa-sin (1558-1619), a civil official during the reign of King Seonjo of the Joseon Dynasty, took part. 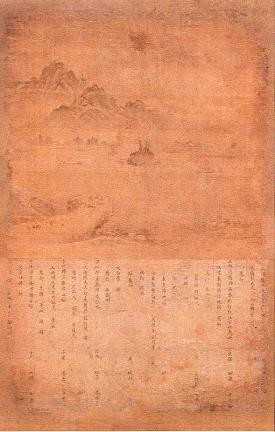 The six pieces consist of paintings of Goewonjangbang gyehoedo (Gathering of Officials from the Office of Diplomatic Correspondence, dated around 1583); Bongsan gyehoedo (Gathering of Officials at Bongsan Mountain, 1583); Taesang gyehoedo (Gathering of Officials from the Office of Religious Services, 1585); Yejonanggwan gyehoedo (Gathering of Officials from the Ministry of Rites, 1586); Hyeongjonanggwan gyehoedo (Gathering of Officials from the Ministry of Justice, 1586); and Miwon gyehoedo (Gathering of Officials from the Office of the Censor-General, 1587). 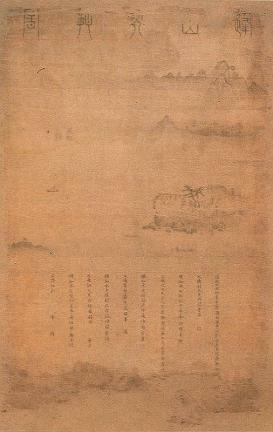 The second, third and fifth pieces closely resemble the one-sided composition that was characteristic of the An Gyeon School in the early 16th century, but the scenery is even more spread out, leaving much space in between. 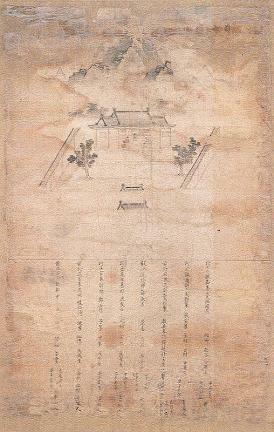 The first and fourth pieces exhibit the characteristics of the paintings of outdoor gathering of officials known as Seohogye, while the sixth piece represents a new artistic style of Gyehoedo depicting government offices that emerged in the 1570s. These paintings are of immense historical and artistic value as they reflect the painting styles of the 1580s, as the production date and the participants are clearly indicated, and also because they are a collection of paintings of social gatherings which commonly feature the same person.